This book is poorly written, and maybe he shouldn't have bothered, because his emphasis is repeatedly on how little information is available. I guess he wants to convey a favorable opinion of Richard III by ignoring any mention of the princes in the tower. All in all it's a pretty mushy compilation of the history. This is one of the more difficult reads in this series.It does tend to jump around too much. As a civil war fought in quick campaigns, Hicks explains that far less documentation survives from the Wars of the Roses than from other period conflicts, such as the Hundred Years War.Even given this lack of historical information on the combatants, their numbers, their equipment, and the exact sites of the battles, Hicks's volume still feels thin.It's also poorly organised, out of chronological order.One chapter lists the outbreak for each of the three phases of the war, even though these phases were ten to fifteen years apart.Then a later chapter lists the other details of each campaign.Overall, it's far less complete a general reference than some of the other Osprey Essential Histories, such as Anne Curry's _The Hundred Years War_. Despite Shakespeare's play Richard III, the Wars of the Roses is one of the tougher subjects in military history to write about.Nevertheless, English scholar Michael Hicks makes a valiant effort to summarize the wars in Osprey Essential Histories volume #54.It is a daunting task.American readers in particular, will find this subject obscure and confusing.Unlike our own Civil War or the English Civil War in the 17th Century, the Wars of the Roses were a series of dynastic struggles where there was little to distinguish the two sides from each other.The opposing Yorkist and Lancastrian factions fought a series of mini-wars over thirty years to determine who would legitimately rule England, but the warring sides were never marked by ideological, geographical, economic or social distinctions.Opposing leaders even switched sides and loyalties seemingly at will, making it difficult to determine who was fighting for whom or what.Frankly, this book is rather difficult to absorb but the author has done his best, and that appears to be enough. The Wars of the Roses 1455-1485 begins with 23 pages of background material to the wars, and then plunges into the main campaign narrative, of 31 pages.The volume includes nine strategic maps of the main campaigns, as well as an excellent bibliography.Throughout this volume, the author is hindered by the paucity of surviving details about these conflicts; as he notes, there are no surviving muster lists from any of the campaigns, which makes it estimation of the size and composition of the opposing armies guesswork.Nor is there are any detailed information on casualties, economic costs and even the locations of the major battles are debatable.Furthermore, the subject is hardly compelling to modern readers.As Professor Hicks notes, the wars had little impact on the English population at large, society or the economy.Unlike the Hundred Years War, there was no "scorched earth" tactics or pillaging by marauding armies to ravage the land and people.Instead, the Wars of the Roses were a series of extremely brief campaigns, fought by less than 1% of the population and affecting primarily the noble classes. Militarily, the Wars of the Roses stands out since at a time when methodical siege warfare was popular, the warring English factions consistently sought to settle their political differences with short maneuver campaigns leading to a decisive battle.Indeed, virtually all of the battles ended in "winner-take-all" circumstances, with the losers forced to disperse and flee or face execution.Nor were there any serious attempts at negotiations between the warring factions, since the long period of political debate that had preceded the conflict had proved so fruitless.However the armies in the Wars of the Roses were second-rate by continental standards, poorly armed and virtually untrained, and the author notes that these wars held no lessons for military theory or practice. In this sweeping history, Trevor Royle details one of the bloodiest episodes in British history. The prize was the crown of England, and the players were the rival houses of Lancaster and York. The dynastic quarrel threatened the collapse of the monarchy as a succession of weak rulers failed to deal with an overzealous aristocracy, plunging England into a series of violent encounters. The bloody battles and political intrigue between the rival heirs of King Edward III brought forth one of the most dynamic ruling families of England--the Tudors. When the Kindle first came out, there was a "promise" made that prices for Kindle books wouldn't exceed $10. However, that promise went by the wayside in the past months. A group of Kindle users is staging an ad hoc boycott of any publication that exceeds the $10 mark. I loved Trevor Royle's account of the English (and Scottish and Irish) Civil Wars, which I bought as a hardback, and would have liked to purchase "Lancaster Against York" in Kindle format. However, the Kindle version is the same price as the hardback, which is rather ridiculous. So I will be foregoing this purchase. The history is about the ruling class, largely written by the ruling class or its in house scribes and captive prelates. Ordinary folk in those days did not know how to read and write, and in many case were prescribed against doing so. We know a great deal about the petty insults and pettier affronts, perceived and inflicted on and by the ruling class, that spilled over reining destruction on those ordinary folk, both French as well as English, who paid for it all. Ultimately, a respect for law and an appreciation of common sense arose out of this age of nation state adolescence, when everyone, from King down to commoner, saw the justice, as well as the advantages, in systemizing things in an open and transparent way, or as open and as transparent as it could be in those days. Only then could England enter the `modern' era, providing a basis and model for the rest of the world, including what became the United States. The book's 22 chapters is an easy read, augmented by a very good bibliography. Lancaster Against York is a thorough and exciting read about an important period in English history. The author tells the story well and the style of the story telling and the subject are entertaining. One should ask what this work brings to the reader that other books on the Wars of the Roses haven't, and the answer is "clarity. "In spite of poor editing and some very awkward sentence structures (he then ill was), the thread of the narrative through very complex times is clear and comprehensive to the average reader.There are only a few times when the author jumps backwards or forwards in the chronology, and his Appendix of names and titles was very helpful in maintaining an idea concerning who was who.In the author's treatment of Henry Bolingbroke who became Henry IV, and Richard, Duke of Gloucester (later Richard III), however, I found his aversion to using first names (except for kings) misleading. There are other problems with certain facts and assertions, but none are so egregious that they detract from the book, at least for the casual reader.Serious historians will find this account somewhat glossy -- passing over very complex issues and situations with a few dismissive sentences either expressing the author's opinion or showing how the actions led to outcomes the author already knows.The participants, of course, were not clairvoyant and took actions based on the information available to them and in what they thought was their best interest.Serious historians delve into those actions and the reasons for them in much greater detail. The author begins his narrative with the reign of Richard II to put the eventual conflict between York and Lancaster into perspective.This is a valuable approach as it puts the genealogy into perspective.Richard was the only surviving son of Edward of Woodstock (The Black Prince), oldest son of Edward III.The Lancaster claimants came down from John of Gault, Duke of Lancaster and the fourth son of Edward III, and York came from Edmund of Langley, fifth son of Edward III.The line of succession went off track when Richard II was deposed in 1377 by Henry Bolingbroke, the 4th son of John of Gault (eldest surviving son to adulthood).This was an usurpation that put the game afoot.Two other Lancastrian Kings followed, Henry V and Henry VI, but then York asserted itself with Edward IV, Edward V and the usurpation of Edward's throne by the younger brother of Edward IV, Richard III.By that time the Lancaster line was essentially played out with only Henry Tudor, the grandson of Henry V's wife, Catherine of Valois and a commoner, Owen Tudor.To say that Henry Tudor possessed a strong claim would be to wildly overstate his case, but he eventually became Henry VII and established the Tudor line in 1485 which led to Henry VIII, Edward VI, Mary and Elizabeth. If the reader is interested in the genealogy in detail during this period, I recommend "Blood Royal" by T. Anna Leese, particularly the chapter on John of Gault and his marriages. The author treats the succession of kings and their adherents fairly without becoming bogged down by criticizing the cruelties and savagery of the time.The legions of nobles were regularly decimated not only in battle but also by being threats to the king in power or even just for being on the wrong side.Survival was always questionable, and it is understandable that England hardly progressed during this period.Marriages were arranged strictly for political or economic reasons, and in Europe's incestuous nobility special dispensation from the Pope (for appropriate consideration) was often necessary to put aside questions of consanguinity.The author's subtitle "And the Foundation of Modern Britain" is a misnomer unless he meant this time to be the last period before the foundation of modern Britain. All that being said, I highly recommend this work to individuals interested in the late Medieval period and English history, particularly since Shakespeare dominates in establishing the popular conception of this period.Needless to say, Shakespeare took extensive poetic license and often followed and even enhanced Tudor propaganda (ala Sir Thomas More) to legitimize the Tudors. In all, well done, and a good read. For the right reader, _Lancaster Against York_ is a four-star book. 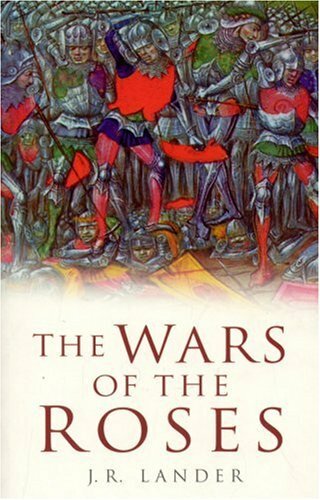 If you're looking for an overview of/introduction to the political and military history of the Wars of the Roses, this is an excellent choice. But there are several important caveats. "Leaving his brother George Neville, Archbishop of York, in charge of affairs in London, he [the Earl of Warwick] took his army north ..."
Second: The subtitle of the book refers to "the Foundation of Modern Britain". This is arguably misleading. The book does not talk very much about the subsequent implications of the wars, or the social changes they introducedor reflected, or how they're relevant to later history. About all it does is give a brief summary of the later descent of the British monarchy. Otherwise, this is a strict blow-by-blow account of who did what to whom. (It is not, for example, a counterpart to Barbara Tuchman's _A Distant Mirror_.) 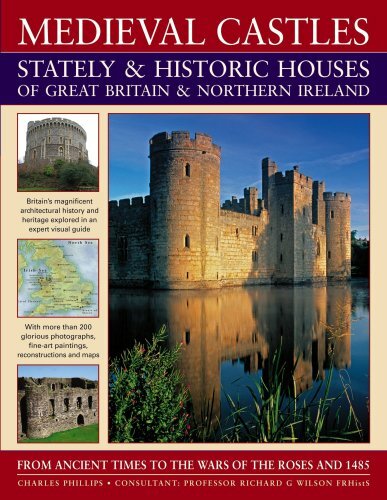 Do not approach this book in hopes of learning much about the origins of the modern British state, or late-medieval arms and armor, or religious upheaval, or social conditions, or economic developments, or anything of the sort. Such things are treated, if at all, as minor adjuncts to the main chronology. * p. 8: "The spark was the decision to raise the poll tax to one shilling (eight cents or $42 today) ..." What? Eight cents is not $42, today or any other day. If this is intended to equate one shilling to eight cents, it's gibberish: one shilling was *twelve* *pennies*, not eight (or any other number of) "cents". * p. 78: Henry V's army en route to Agincourt "consisted of 105,000 soldiers". This is highly improbable for a medieval host. On the very next page, furthermore, we are told that Henry had lost a third of his fighting men", leaving him with ... 6,000. A few pages later, we are told that the French had 20,000 men, that they outnumbered the English by six to one, and that (once again) the English numbered 6,000. * p. 320: Anthony Gray was the "4th Duck of Exete". Quack, quack. Not all of this is necessarily Trevor Royle's fault, but it's all part of the book. However: these (aside from the editing) can be seen as legitimate authorial choices. They're not necessarily problems, just features that will appeal to some readers more than others. 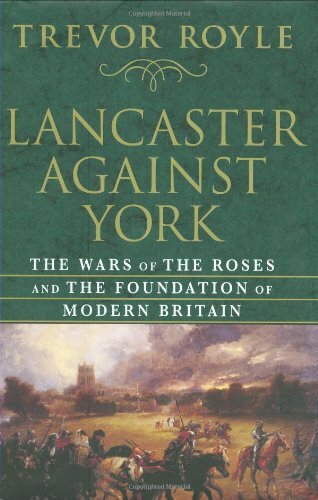 I'd describe _Lancaster Against York_ as, in effect, a very good "newspaper account" of the Wars of the Roses. Royle is excellent, and very complete, at describing the essential newspaper features of every battle and every political twist--who, what, where, when, and why. This is, perhaps, a good justification for including so many minor characters: they were there, they were part of the story, and some reader might want to follow up. Indeed, this would be a great book for someone who wanted to get a grounding for some further deep research. Also, in spite of the cast of thousands, Royle does succeed in keeping his main focus on the various Kings of England and their immediate cohorts. This is conventional, perhaps, but it is essential in book about factional fighting for control of the English Throne. And it can be surprisingly difficult to maintain such a focus, particularly in a tale with as many turns as this one. Even if you find yourself losing track of the secondary players, the relationships and actions of the big names are always clear, and will let you follow the main thread of the story with no difficulty. So I recommend the book--for the right sort of reader. It is what it is; don't go into it expecting something else, and you'll be pleased. Based on archival sources that have not previously appeared in print, this history of the Wars of the Roses is told from the perspective of the women behind some of the key participants as the conflict between York and Lancaster ebbed and flowed. An examination of the six sisters of Warwick the Kingmaker who all married powerful noblemen fighting on opposite sides in the Wars of the Roses, this history serves also as an exploration of the role of these women in 15th century society. This is the first time that the Wars of the Roses have been studied from a feminine perspective. The Kingmaker's Sisters is more like a textbook than a work of popular history. It's definitely not one of those history books that grip you right from the start, and keep you hooked till the last page. There's no real sense of atmosphere; you don't feel you've been transported back to the fifteenth century, and that shadowy historical figures have come alive. As Baldwin writes in the introduction, "It is sometimes argued that it is unrealistic to attempt biographies of those who lived in the Middle Ages because the detailed, personal information that would make this possible is simply not available." Although he presumably didn't agree - or else he wouldn't have written the book - this turns out to be the case. It reads like a lecture. This was explained when I turned to the back flap and read, "David Baldwin is a popular lecturer who has devised and taught history courses at Leicester University for many years." More than is usually the case with history books, he opens paragraphs with questions such as a teacher might use in a lecture (e.g. "What did the sisters read or what were they encouraged to read as children and adolescents?"). He also uses far too many exclamation points: "A greater mistress would have had a larger home (and probably more of them!)" - "He does not seem to have been present (on either side!) at either Barnet or Tewkesbury" - "The answer is perhaps that they were no more, or less, pious than most of their contemporaries, and that their main preoccupation was to have the best of this life while keeping a close eye on the next!" The publisher should have cut most of these out. In a school textbook, they might have had their place - but grown adults don't need their history peppered with this many exclamation points. The Kingmaker's Sisters isn't awful - it's just "thin" and lacking in content. There simply was not enough information about these women to make an interesting book, and none of the sisters even stood out from the others - they remained little more than names and titles. Thus, this is another one I'm glad I got from the library. If you are going to get it, I recommend waiting for the paperback. It's not a complete waste of time, but I didn't gain enough from it that I wouldn't have felt seriously cheated if I'd paid for a hardback. 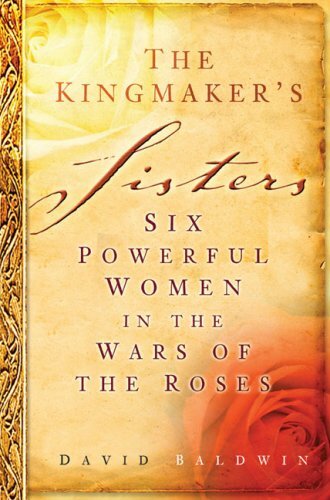 The Kingmaker's Sisters: Six Powerful Women in the Wars of the Rosestraces the lives of Joan Neville, married to William Fitzalan, Earl of Arundel; Cecily, married to the short-lived Henry Beauchamp, Duke of Warwick, and the notorious John Tiptoft, Earl of Worcester; Eleanor, married to Thomas, Lord Stanley; Alice, married to Henry, Lord Fitzhugh; Katherine, married to William, Lord Harrington, and William, Lord Hastings; and Margaret, married to John de Vere, the long-imprisoned Earl of Oxford. Through their husbands, the sisters often found themselves on opposing sides during the Wars of the Roses, and several experienced individual tragedies because of this. The dynastic struggles of the Wars of the Roses (1455-85) have traditionally been portrayed as belonging to one of the most dramatic periods in the history of England, an age of murder and melodrama. In this classic history of the wars, charting their origins, progress, conclusions and effects, Professor Lander sets the record straight. By putting the wars into their contemporary context, using the written records of the time (many of which are reproduced in the text) and the results of modern research and scholarship, the true picture emerges. The wars were, in fact, very limited. While not denying that contemporary English society was disorderly and violent, Lander suggests that this state of affairs was due far less to civil war than to habits of violence among all classes of society. Fluently and clearly written "The Wars of the Roses" is the perfect overview of one of the most famous of medieval conflicts. Shedding light, as it does, on fifteenth-century history as a whole, the roots of the Tudor dynasty, and the background to Shakespeare's history plays, this book deserves a place on the bookshelf of anyone interested in this most turbulent period. A quick search of books will show a list of dozens with the title `The Wars of the Roses' or some derivative thereof; in the past generation, much scholarship has been devoted to this particular and peculiar event in English history, and that has had the somewhat unfortunate outcome of making it out to be a far more dramatic episode than perhaps a raw interpretation of empirical data might warrant.Add to this the undoubted dramatic flair of the Shakespearean revisionism for the benefit of the Tudors and later dynastic houses, and one gets the sense that this was an occurrence in English history of truly epic proportions. 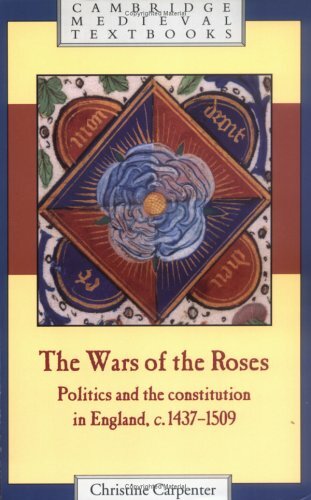 While the events that collectively now fall under the classification `The Wars of the Roses' were certainly pivotal in the overall dynastic stream of English (and, ultimately, British) history, J.R. Lander puts forward the case that in fact the Wars of the Roses is a misnomer - compared with contintental European warfare, the events constituting the multi-generational Wars of the Roses (and attendant prelude) seem no more than mere skirmishes.`During the Wars of the Roses the total period of active campaigning between the first battle of St Albans (1455) and the battle of Stoke (1487) amounted to little more than one year - one year out of thirty-two years.Henry VII's progress from his landing in Milford Haven to his victory at Bosworth Field lasted only fourteen days. 'Indeed, even the symbolic nature of the term, the Wars of the Roses, is not entirely accurate, as the rose on each side was but one of many symbols used. Lander describes situations in terms of strategies military and political, tactics and ambitions that all pale by comparison to European counterparts.Most English cities were not fortified; most castles and great houses did not suffer siege; the idea of burning crops and laying waste to cities and villages was far from commonplace practice.Lander conjectures that the prominence of the Wars of the Roses in the stream of English history may be due to the lack of foreign invasion and involvement; even the French campaigning of the English up to this period was far more intense and far more destructive, and yet the prominence of that cycle of warfare in English history is much smaller. Perhaps it is because of the fascination and sometimes automatic identification of English history general with English royal history particular that the Wars of the Roses took their pride of place.After the general introduction in which Lander puts forward his caveats and reservations, he proceeds to explore the history of the House of Lancaster, the House of York, periods of peace and stability as well as particularly intense periods of struggle, and Lander devotes individual chapters each to Richard III and Henry VII.Lander also addresses the strange case of Perkin Warbeck, and presents in good fashion the various arguments pro and con in controversies such as Richard's possible murder of the princes in the tower versus the claims of someone like Warbeck. Lander uses extensive sections of previous material - rather than paraphrasing or re-interpreting earlier chronicles, he inserts large sections of the material to allow the reader to make her or his own evaluation of the material.This book was first published in 1965, but most of the material quoted is not out-of-date even forty years later, as it comes from chronicles and documents contemporary with the events they describe, or histories written shortly thereafter.It remains an important contribution in the scholarship of the time. Excellent general reference on battles and equipment. This volume in Osprey's limitless Men at Arms series offers an excellent overall reference on the battles and the arms and armor of this late 15th-century civil war.The breakdown of law that resulted from the existing system of hiring soldiers is explained, as well as its repercussions on the conflict.Small maps are included for all the major battles, including Towton, Tewkesbury, Hexham, Barnet, and Bosworth.The discussion of equipment includes several subtleties, such as the correct origin of the term "pole axe" and the dubious historical value of medieval harnesses of plate assembled by later collectors.
" Now is the winter of our discontent...."
The War of the Roses is the name given the the struggles in the late 1400s between British nobles from the competing houses of York and Lancaster for control of the English throne.The figures involved in these struggles (Richard the Third, Henry the Fifth, etc.) are the subjects of some of Shakespeare's most famous plays and, indeed, their political affairs are dramatic and colourful.The events of this civil war are parallel in style to the struggles in Renaissance Italy that set the context for Machiavelli's "The Prince. "Charles Ross's book is a helpful introduction--about 140 pages of reading--to the main developments in these struggles that led shortly thereafter to the rule of Henry VIII, and then Elizabeth I.Ross's interpretation is a bit conservative, but overall he gives a fair sense of what was happening and why.This would be a good first book to read to get a handle on what the "War of the Roses" was about. At first, I felt the book went at a break-neck pace through years of changing alliances and shifts in power, not giving a novice enough detail to understand why the momentum would shift from one house to another.However, I greatly appreciated the real "meat" of the book in the last two chapters where Ross goes on to explain the effect of the wars on the culture of England.I teach World History to high school freshmen in a college prep environment.Each of my students is following a certain theme, and I will definitely direct some of them to the final chapters of Ross's book.For those following battles, there are diagrams of Barnet and Bosworth with paragraphs explaining tactics.For those following architecture, Ross explains how the wars did (or did not) affect building styles and plans of the nobility.For those following economic patterns, Ross explains how various groups (nobility, towns, merchants, etc.) were influenced by the wars and by foreign alliances made by Yorkists and Lancastrians.For those studying women's history, the Wars of the Roses more than any other (I think) show the "value" of marriage in military alliance.There is even a section showing how literature was affected and an interesting segment on Sir Thomas Malory (author of *Morte d'Arthur*).The last two chapters also help students understand the concept of the "new monarchy" and the declining power of the feudal nobility that occurred in the aftermath of the Wars.What is more, the paragraphs in the last chapter, in particular, will give great practice for younger students in their attempts to follow the development of an idea over several paragraphs, a great skill for ACT and SAT practice.I will definitely be getting a copy of this book for our school library! I am a reasonably intelligent person, was a theater major in college, and have read more than my share of the tragedies and comedies of Shakespeare.I was, however, quite at a loss upon completing the first Act of RICHARD III.I was completely lost. The endless queue of corpses, pretenders to the throne, and partisans of one competing group or another left me completely bewildered and confused.I knew that Richard was unscrupulous and evil, and that he had managed the deaths of many of his relatives, but by and large I was unclear on all of the details. The fault lay not with Shakespeare but with my knowledge of English history.The depth of my ignorance about several periods of history is unfathomable.Among those areas of ignorance are several of the military conflicts in European history.I know that there was a Hundred Years War (that lasted considerably more than a hundred years), a Thirty Years War (that I believe was fought in the early 17th century for God knows what reason), and the Wars of the Roses.To be perfectly honest, until recently I had no idea when the Wars of the Roses were fought, between whom, nor why.Imagine my delight when I discovered that this was precisely the conflict with which most of Shakespeare's historical plays dealt.Learn about this period of English history, and I have the background I need to read RICHARD III and the other historical plays.After some brief research, this volume appeared to be one that would give me what I needed to know about the conflict. I have to admit that it did the trick.I have now restarted reading RICHARD III, and I not only understand Shakespeare's narrative, I know his account of things is extraordinarily wrong!Primarily he changes chronology to suit his purposes, and recreates historical scenes that could not have happened.There is no evidence according to Ross that Richard in any way plotted against either his brother Edward IV (he in fact seems to have been his staunchest supporter) nor that he machinated his brother Clarence's imprisonment (Clarence was the tool of Warwick, who pushed him forward as a pretender to the throne).Nor was there ever a time when Margaret could have made her long, impassioned speech.Actual historical chronology would have precluded it. In short, Shakespeare recreated history for dramatic effect, and painted Richard far, far blacker than he in fact deserved.He was not, however, a nice guy.Most historians agree that he probably did have his nephews murdered, and there is some evidence that he killed his wife Anne (daughter of Warwick) with the idea of marrying his niece Elizabeth (who in fact married Henry Tudor, later Henry VII).Shakespeare more or less gave the Tudor party line, and then some.Had Richard III won the Battle of Bosworth, he undoubtedly would have painted Richard as a great hero, and Henry Tudor as a black hearted villain. For those who like the books to be pleasant to look upon, I am happy to report thatTHE WARS OF THE ROSES is a beautifully produced paperback book, sewn in signature, printed on high quality paper, with a huge number of well-reproduced photographs.In short, quite apart from the content--which was excellent--it was a complete pleasure to hold and look at this book.It certainly enhanced the reading experience. 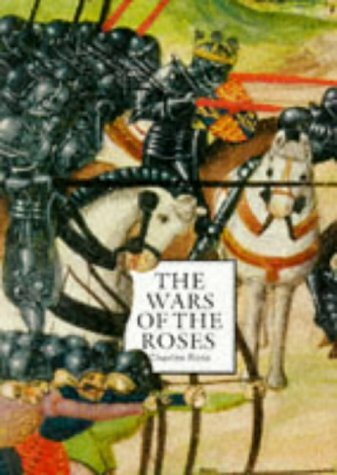 Ross draws upon his experience as a professor of Medieval History at the University of Bristol to provide the reader with a well written survey of the Wars of the Roses.He presents the reader with discussions of views held by chroniclers of the period, as well as those of modern historians.Ross divides the topic into five main categories: 1. the historical traditon of the wars; 2. the origins of the civil wars; 3. civil war and dynastic revolution; 4. the military aspects of the wars; and 5. the impact of civil war on English politics and society.The book is well illustrated with 126 black and white illustrations, a map and two battle plans.Genealogical tables help the reader understand the relationships amongst the houses of Lancaster, Tudor, Beaufort, York and Nevill.Although the bibliography is short, Ross enhances its value by short comments regarding each book or article.If the reader becomes confused by the use of titles to refer to the major players, a quick glance at the well written index where the title includes entries for the Christian and Surnames for the individuals holding the title. 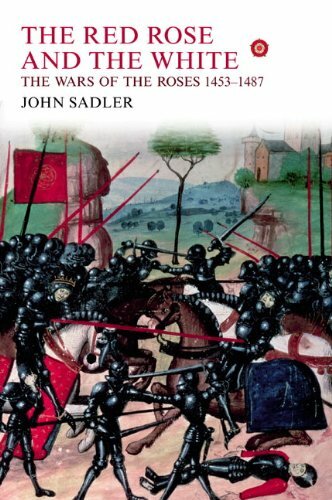 I highly recommend this book to anyone looking for a survey on the Wars of the Roses!Readers who are interested in biographies of the kings will want to read Ross' biographies of Edward IV and Richard III. The vicious conflict between the English noble houses of York and Lancaster—known as the War of the Roses—marked the end of medieval England and the birth of the Renaissance. Here is a concise and fascinating study of that 30-year period, which recounts the secret plots, hidden romances, royal murders, great battles, political intrigues, and broken promises. Written by a popular and well-known military historian, it follows the collapse of the great Plantagenet dynasty, which had ruled all of England and much of France for more than 300 years, and the rise of the Tudors, destined to dominate British political life during the 16th century. From Henry IV, the first Lancastrian king, to Richard III, The Wars of the Roses follows the history of the kings of the houses of Lancaster and York who shaped this tumultuous period of English history. Anthony Cheetham provides insight into the politics, society, and economy of this time, and above all, he conveys the personal histories and characters of its rulers. If you are looking for a quick way to get an idea of what was going on with the Houses of Lancaster and York during the 15th century, this little book might be just the ticket. It is a short book of only 101 pages, and the large number of illustrations reduce the text pages to only about 50. The book includes a Genealogical Table starting with Edward III which helps immensely in understanding the complex relationships between the players. Since I found the table so useful, I would have liked it to have been more complete, and - something I wish for in most such tables - for there to have been some way to more readily recognize contemporaries. The table does help in knowing what's going on, though, particularly since the author refers to the players in different ways at different times; sometimes by first name alone, sometimes by title alone, sometimes as so-and-so's brother, etc. He seems to be unaware that the reader may not automatically know which Suffolk (for example) he is referring to. 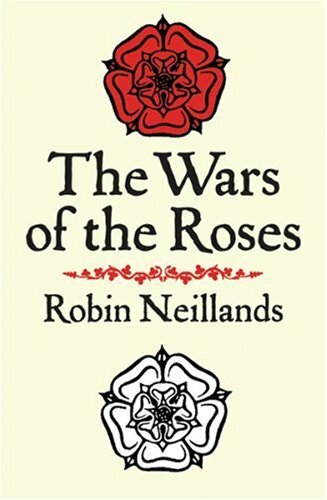 The result is that if you really want to piece together the picture of the Wars of the Roses, this little book can do the trick, but it takes longer to fully digest than the number of pages might suggest. The Wars of the Roses (1455–85) were a major turning point in English history. But the underlying causes for the successive upheavals have been hotly contested by historians ever since. In this original and stimulating new synthesis, distinguished historian Michael Hicks examines the difficult economic, military, and financial crises and explains, for the first time, the real reasons why the Wars of the Roses began, why they kept recurring, and why, eventually, they ceased. Alongside fresh assessments of key personalities, Hicks sheds new light on the significance of the involvement of the people in politics, the intervention of foreign powers in English affairs, and a fifteenth-century credit crunch. Combining a meticulous dissection of competing dynamics with a clear account of the course of events, this is a definitive and indispensable history of a compelling, complex period. During the second half of the fifteenth century, a complex and violent struggle for the English throne erupted between the supporters of the House of York and supporters of the House of Lancaster. The rise and fall of these dynasties, and the mystery of the fate of the Princes in the Tower, have made the Wars of the Roses the subject of countless novels, plays, poems, and films. 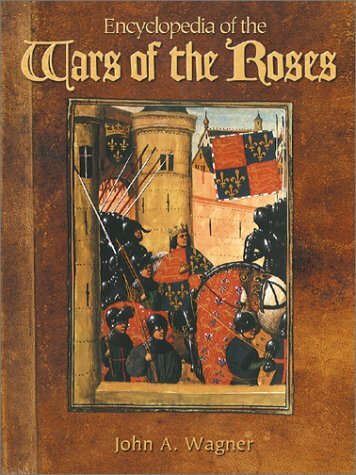 Very strongly recommended for both school and community library historical reference collections, Encyclopedia Of The Wars Of The Roses by historian and educator John A. Wagner is a thorough and informatively presented historical account of the grueling war of the fifteenth century between the House of York and the House of Lancaster that came to be known as the "War of the Roses". These were two factions of the British aristocracy who shed a great deal of blood in political intrigues and armed confrontations as they strove for the power to rule England. Entries are arranged in "user friendly" A-to-Z format giving detailed information on the battles, historical figures, key events, and more for a prolonged civil war that became a engaging subject for Shakespeare plays and Hollywood movies. "Weir does a masterful job of leading the layman through the entwined family trees of England's powerful families and the many usurpers to the throne. . . . [She] has perfected the art of bringing history to life." Alison Weir, one of the foremost authorities on the British royal family, brings brilliantly to life both the war itself and the historic figures who fought it on the great stage of England. 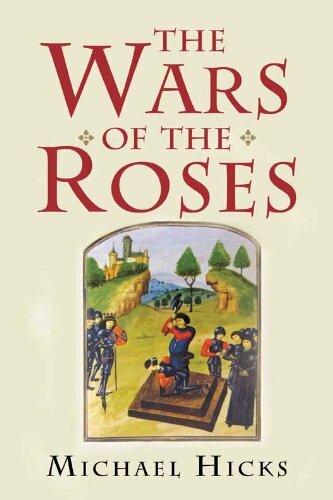 The Wars of the Roses is history at its very best--swift and compelling, rich in character, pageantry, and drama, and vivid in its re-creation of an astonishing, dangerous, and often grim period of history. "[A] spellbinding chronicle. . . Weir's dark, glorious pageant restores the personal dimension to an oft-told tale without losing sight of a war that shattered feudalism, paved the way for capitalism and weakened the monarchy." "[Weir is] skilled at delineating the many memorable characters of the age. . . . It's a tribute to her skill that she leaves you wanting more." 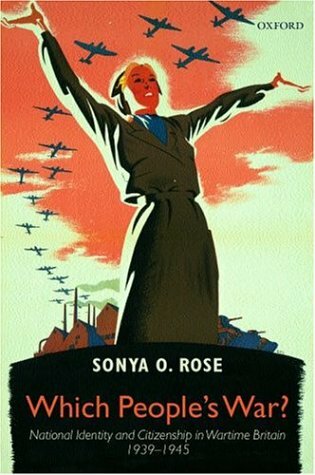 I picked up this book while wandering through a mall bookstore the night before my flight to California; I live on the east coast.Needless to say, I could not put it down and had to set aside some time during my first two days in CA to finish it!I knew nothing about this war or the author at the time. The truth is truly stranger than fiction; you cannot make this stuff up.And yes, I made the cab driver stop at the nearest Borders on the way back to the airport to pick up the Princes in the Tower!I'm not a fan of her fiction, but her historical research is incredible.I would love for her to write a biography of Richard III or Edward IV. Alison Weir continues to spout the Tudor propaganda, even in the face of evidence that it was the Tudors who kept this war going, and that it was the Tudors that killed the Princes (even after evidence that their mother wrote to her cousin telling her of a visit to see the boys AFTER Richard III was dead).Some people believe what they want, but Historians should seek out the answers, not simply regurgitate what others have writen before them.She constantly ignores evidence that shows the good side of the Yorkists, and the rather brutish side of the Tudors. Not recomended to anyone wishing to learn the truth.Two thumbs way down.Heck, read Daughter of Time for a less fictional tale. Ms Weir has a wonderful sense of style and intimacy in her writing.I never thought I would enjoy reading British history.While never making categorical assumptions in her narrative, she guides you through likely scenarios for the blank spots of history and builds the background with lots of texture and details without becoming boring.Her familiarity with the historical sources and the material gives you an inside look at the royals.I went on to read The Princes in the Tower after this book because the story was so compelling.The genealogy tables in this book are too small, but the ones in the Princes in the Tower are in the front of the book, not the back, and much much easier to read. "Edward was oblivious to the fact that [Elizabeth Wydville] was also calculating, ambitious, greedy, ruthless and arrogant." Let us forget for a moment that Weir forgot to put a comma after "ruthless". What irked me about this statement was that, despite its condemning and final tone, it is never backed up with any substantial form of reasoning. The reader is simply told this and never given any explanation. Weir brings up the fact that Elizabeth Woodville made her mother serve her on bended knee and her brother kneel to her in public, but this was common practice for queens of the era. Weir also calls the family rapacious for taking positions in court, a practice which was, for one, natural of a new queen's family, and two, not as extensive as she makes it out to be. While a case can certainly be made--justly or unjustly, as it may be evaluated--that Elizabeth was in fact greedy, ruthless, or calculating, it should not be made based on the flimsy support that Weir has employed, and certainly not in such an absolute manner. This is where I believe Weir was using hysterical writing to heighten the dramatic and gossipy feeling of the book. It's entertaining, to be sure, but not necessarily in good judgment, and leaves the reader somewhat shortchanged. The writing in itself is very standard and nothing special. In fact, it's almost average, but that did not hinder my reading of it because this is, after all, a history book which I was reading for history's sake. It's always nice when historians have literary talent too, but it's not strictly speaking necessary, at least in my opinion. One thing that did bother me, however, was the fact that the editor failed to catch a few mistakes where quotes were left open-ended (in other words, the end quotation mark was missing), leaving the reader to figure out where the quote ended and Weir's narrative recommenced. Though it was mostly a simple task to figure out, a few instances were hard to discern. Also, though this is no fault of Weir's, I would warn prospective buyers that this book only covers the events up to and including the Battle of Tewkesbury in 1471. Those wishing to read further must then acquire Weir's book on the princes in tower. 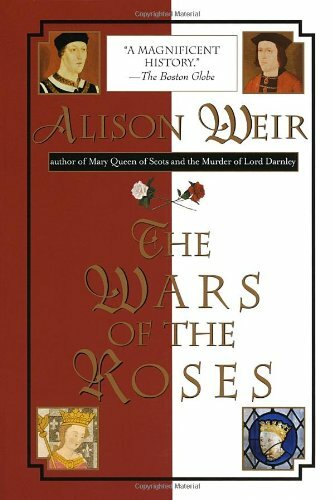 Overall, I found The Wars of the Roses to be a fun, entertaining history, although Weir can fall into the habit of overstating her conclusions about certain figures and events which begins to seem a little like bias, although it doesn't totally cross that line. It seems that she was, for the most part, trying to be balanced, and this is a useful tool for anyone who wants a basic knowledge of the Wars. Buffs will not gain much from its reading, as it is mostly a chronology of main events with the usual detail. 3 stars. Recommended. Although I studied English history as part of my undergraduate program in history, my main focus at the time was ancient history.After taking three quarters of English history I could probably recite the succession of the English kings after Alfred the Great, though I doubt whether their eras really came "alive" for me at all.I'm a very visual person and since reading an almost catalogue-like text covering the entire history of the Island to, as I recall, World War I isn't likely to raise vivid images, I wasn't really "connected" to English history as an "experience. "Fortunately my advisor for my MA believed in a very wide base of knowledge for his graduate students.By the completion of a PhD for him, the candidate had to be able to pass oral and written exams covering the ancient Near East and the Greco-Roman worlds from 3000 BC to the fall of Rome (~500 A. D.) and also the European Middle Ages (~500-1500 A.D.).This reintroduced me to English history but in such a general way, I doubt whether I could have added much to the simple king list I'd already learned, although I did manage to learn something about the ecclesiastical side of that period.I strongly suspect that one of the reasons that people find history so "dull" is from precisely these types of experiences: all facts, no "experience. "The reader need not worry that they will be bored by this book at all! What really "turned me on"---as we used to say in the olden days---to the Medieval period in England was actually a series of murder mysteries featuring an Welsh archer, Owen Archer:The Cross-Legged Knight by Candice Robb, which are set in the period of the Edwards, primarily Edward III.Her recreation of the social setting captures the reader's imagination and makes life during the times something with which one can relate.Other mystery authors also helped me engage with segments of this long period:Michael Jecks writes interesting Medieval mysteries focused on a Templar Knight,Sir Baldwin Furnshill, The Last Templar, set again in the reigns of Edwards, while Ellis Peters wrote the Brother Cadfael series, One Corpse Too Many: The Second Chronicle of Brother Cadfael, A Morbid Taste for Bones: 1400 Headwords (Oxford Bookworms Library), set in the reign of King Stephen.It was then that I began to read biographies of the historic individuals that I came across in these works of fiction. (Which just goes to show you that historical fiction definietly has its place in the educational system, since anything that inspires a reader to learn more is worth the investment! )I wanted to know more about their characters and the political issues of their times.This ultimately brought me to the books written by Ms Weir. While I have read a number of books on the events of English history set in the period from Stephen to Richard III, I find that Alison Weir's works, which include a greater focus on the women of the period, resonates with my own understanding of history in general.Even as a graduate student in the 1970s it was abundantly apparent that the way history was written left out half the story.Almost no women other than Cleopatra seems to have had any part in it!And on the rare occasions when one is mentioned, their part in history is relegated to glorified housekeeper--the men did the heavy lifting, therefore women didn't do anything but keep house.To read classical Greek history is almost to suspect that there were no women in Greece at the time!Ms Weir's works, Eleanor of Aquitaine: A Life (Ballantine Reader's Circle), Queen Isabella: Treachery, Adultery, and Murder in Medieval England, Mistress of the Monarchy: The Life of Katherine Swynford, Duchess of Lancaster, and others have managed to fill in some rather large lacunae, at least in the Medieval English venue. The War of the Roses is no exception.When I first took up the book, I had the notion--drawn primarily from my reading of Shakespeare's history plays, especially Henry IV , Parts One and Two(No Fear Shakespeare), and Richard III (Folger Shakespeare Library)--that this period was primarily the conflict between the houses of Lancaster and York and again a male history.I should have known better.Here a woman--in fact several--took a central role in the drama that unfolded.For most of the book, Margaret of Anjou, the queen of Henry VI, played center stage, as she attempted to centralize control of the government in the hands of the crown despite her husband's total disinterest in government. To ensure the heritage of her son, Edward of Lancaster and Prince of Wales, she gathered a number of important magnates to support their cause and enlisted assistance from Burgundy, France and Scotland.That she failed miserably and managed to alienate her son's future subjects is less "the story" and more "the outcome" of her efforts.In reading the historical accounts presented in many of Alison Weir's books, one comes to have a much clearer understanding of the events of the time.Not only was England not populated entirely by males, the females who resided there took an active part in shaping events, for better or worse.A "feminist" view of history does not involve relegating the male to the sidelines while glorifying the roles of females, and this fact is made quite clear by this "warts-and-all" history of the War of the Roses.Nothing is more apparent that that the motives and goals of many of the women of the period caused great havoc.The point is that the motives and goals of ALL of the players could and did, and it is only through a clear understanding of ALL the players that anything like a realistic history of any age can be written. One thing that becomes very apparent in the book is the degree to which entanglements with France through English land holdings there, caused such upheaval in English politics.To safe guard or extend these properties, the monarchy often used marriage diplomacy, introducing French wives as queen consorts.The very different socio-political expectations of the two countries seemed to create incredible problems in England as a result.Margaret of Anjou is a clear case in point.It seemed that everything she did to gain control was a disastrous miscalculation of the alien culture in the midst of which she lived.Given the constant issues that arose because of English interests in France, one can't help but feel that William the conqueror created one big headache for his genetic and political descendants in England.Too bad Harold didn't win at Hastings! 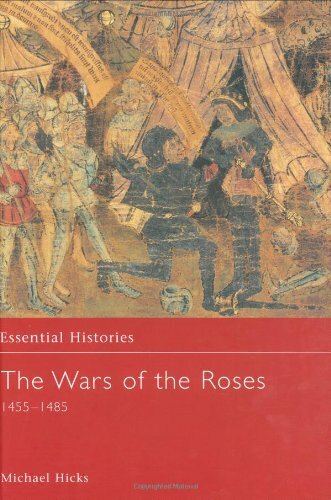 The first comprehensive single volume history of the Wars of the Roses since 1981. The Lordly Ones is a must have for any reader of history, especially those just beginning the journey of researching the War of the Roses and the powerful Neville family and the critical role they played in it. Richardson, skips the prose and gets straight to the point in an easy to read fashion that never skims over the details, yet makes the issues more striking and easy to recall with his charts and maps.He's also cleary comfortable offering his own opinion while laying the background on this complex family that turned into the ultimate family of 'players' by a series of masterful marriages. While I enjoyed Seward's approach to this topic - he examines the civil strife as it affected the lives of William Hastings, Margaret Beaufort, John Morton, John de Vere and Jane Shore - it's not a book for those without some knowledge of the Wars of the Roses. The transition is often difficult to follow. It's as if the book were edited to reduce the size of the content so that a paragraph may contain a series of pronouns with no obvious name to attach to them. I also found the citations to information stated as fact to be inconsistent. Some claims were cited; many were not. Although certainly by the sections on Richard III, it was obvious that the majority of his sources were the controversial early chroniclers, such as Sir Thomas More. Despites these problems, I enjoyed the book. I don't necessarily swallow Seward's interpretation of events, but they do inform about the traditionalist viewpoint. He could have toned down his bias against the Yorkists, but that would have made for very dry reading. If you have a basic handle on the time period, or if you're a student of Ricardian history, this book adds to the body of literature available because of its focus on the lives of lesser known players. 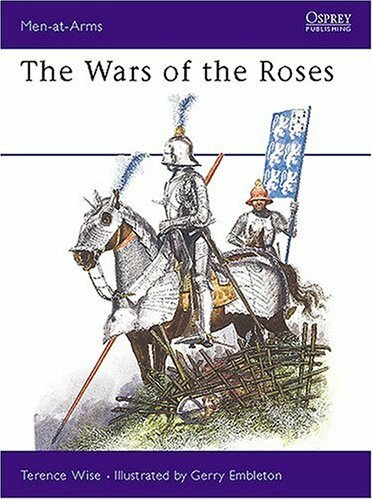 Seward has taken five key players in the Wars of the Roses and told their stories.The result is entertaining and full of good factual information, but as a story it is so lopsided as to be useless if you're not already familiar with the history of the period. Seward writes well enough, though his style's not as entertaining as Alison Weir's (whose history of this period is a much better place to start).The problem is not his style, though; there are simply too many threads in the story for this to be a good way of telling it.Seward tries hard to make the historical sequence mesh with the stories of his five protagonists; he cuts the story into chapters which are in chronological order and each of which revolves primarily around one of the five.However, the points at which the book flows most smoothly as history are exactly the points where he focuses least on his protagonists. If you don't think of this as a history of the Wars of the Roses, though, and instead think of it as five interlaced biographical sketches, this is a very worthwhile book.Because of the focus Seward has chosen, there is a lot more detail about these individuals than you will find in most of the histories.The men in particular stand out: the Earl of Oxford, William Hasting, and John Morton.The women (Margaret Beaufort and Jane Shore) are less memorable, sadly; mainly because there is so little actual information about them, and they were perforce only indirect players in much of the political manoeuvering of the age. Recommended; but read something else first -- this is better as background material than as an overview of the period. 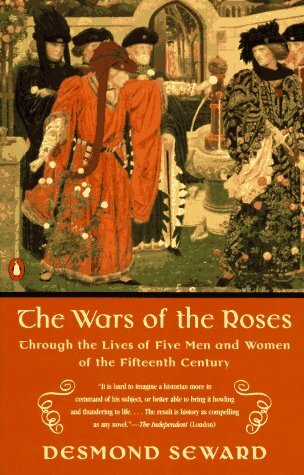 Although Seward's approach to the Wars of the Roses was well researched and loaded with facts, his approach is disappointing.Seward relates the history of the Wars through the lives of five bit players:Margaret Beaufort (Henry Tudor's mother); William Hastings (Edward IV's friend & advisor); John Morton (Henry's advisor); John DeVere, Earl of Oxford (a Lancastrian); and Jane Shore (Edward IV's & William Hastings' mistress).The end result is disappointing because Seward is forced at many points to tie the bit players into the narrative through assumptions. In fact, Jane Shore's role is minimal; most of these sections are actually about her father, John Lambert. On the plus side, Seward provides the reader with a number of features which leads the reader to a better understanding of the Wars and the players involved: a chronology; a who's who of the major and minor players which is accompanied by short biographies; and genealogical charts. 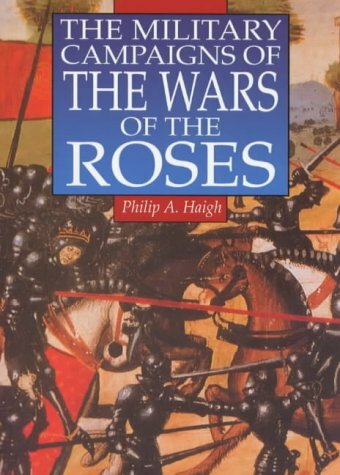 This book should be viewed as a supplement to other books on the Wars.The following books provide the reader with a much better understanding of the Wars of the Roses: 1. 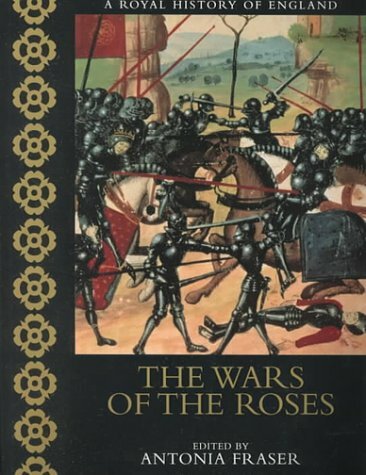 The Wars of the Roses by Charles Ross.This is a great survey of the period written by a professor of medieval history.2. The Chronicles of the Wars of the Roses, edited by Elizabeth Hallam.A superbly written and illustrated survey which is unfortunately out of print.3.The Wars of the Roses by Alison Weir.Weir's book brilliantly covers the preludes to the Wars and the Wars through the reign of Edward IV. Having read the author's excellent work on the military religious orders, I frankly expected much more on this, a familiar topic.I was extremely disappointed.In addition to misstatements of fact, his main objective seemed to be to blacken the name of every Yorkist who gained the throne, as well as that of Richard, duke of York.Further, he makes the rather unpleasant Henry VII Tudor virtually into a god.All in all, the book appears to display an unfortunate animus and is overly concerned with Richard III, a subject handled with much greater dexterity by Weir and others, whether or not you agree with their conclusions.This was not a book on the Wars of the Roses, but on the general familial and cultural milieu which formed the character of Richard III.It should have been so titled. 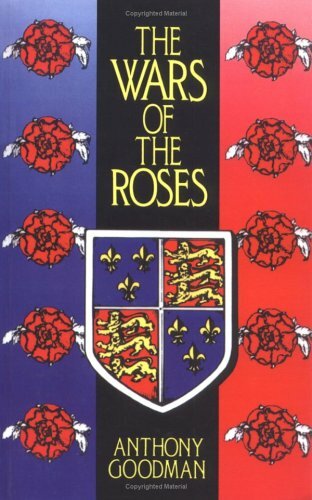 This history follows five second tier players through the War of the Roses:William Hastings, Edward IV's best friend; Jane Shore, their mistress; Margaret Beaufort, the mother of Henry Tudor - the top Lancastrian during the second phase of the war; Archbishop Morton, Henry's crafty advisor and the Earl of Oxford, a ranking Lancastrian.